Rolling with the punches is a necessity on a mission trip here or abroad. You never know what to expect and have to be flexible to accommodate last minute changes for any number of reasons. If you’re a control freak trying to recover, I suggest you look into service work to break you of this damaging characteristic. I may never be a fully matured adult and often find amusement in silly things. For instance, I cannot hear or say “European” without giggling or at least cracking a slight smile. From what I understand, people appreciate my sense of humor, for the most part. Things around our home have been intense for quite a while and I have to admit, I’m overdue for some giggles. God has a unique way of communicating with me and often uses small details and dry wit to get my attention. I love when He speaks my language, it makes me realize His presence throughout my day. Today, He made me giggle with this recollection while reading His word. 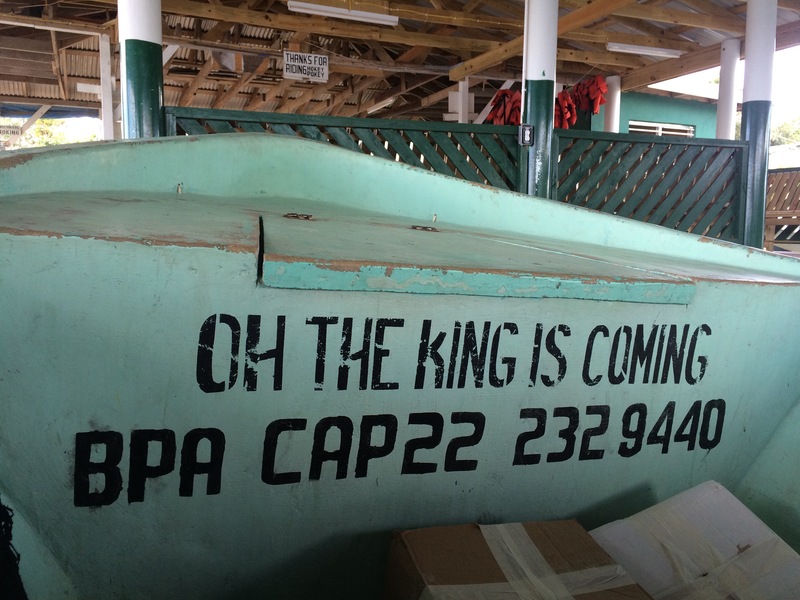 After an intense week of teaching and ministry in Belize, I heard we were going to take the Hokey Pokey ferry to our R’nR destination in Placencia. 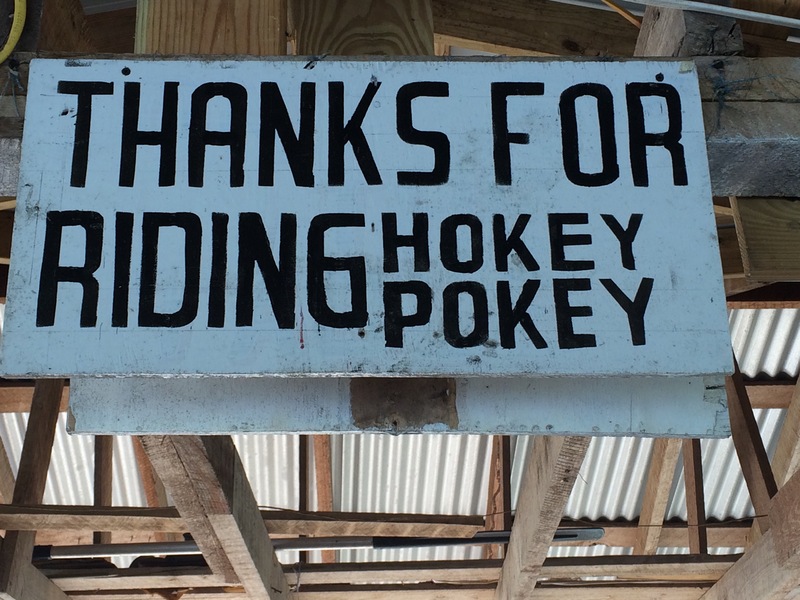 We arrived at the Hokey Pokey station and my mind was twirling with all that I had seen, heard, and felt on the trip. I was wondering how I could start to decompress for reentry to America. Fact is, when you’ve been on a spiritual high for over a week, you wonder if you might be able to descend, well aware you will never be the same again. I felt comic relief as we waited for our ferry. The station is filled with whimsical and philosophical quotes to ponder as you wait. I took a photo of each and every one, giggling with amusement by the time we boarded the ferry to Placencia. Imagine my delight as the last person to board, this was my view as I dropped into the front seat. The childhood song starts by putting each appendage into the song. You sang that, didn’t you? See… I am immature but I’ve got a fun sense of humor. …go out and preach the word! Go whether it’s an opportune time or not! Reprove, warn, and encourage; but do so with all the patience and instruction needed to fulfill your calling because a time will come when some will no longer tolerate sound teaching. Instead, they will live by their own desires; they’ll scratch their itching ears by surrounding themselves with teachers who approve of their lifestyles and tell them what they want to hear. They will turn away from the real truth you have to offer because they prefer the sound of fables and myths. But you must stay focused and be alert at all times. Tolerate suffering. Accomplish the good work of an evangelist, and complete the ministry to which you have been called. These words gigged me out! I’m trying to stay focused and alert to discern His call on my life. I’m patient for the next leap of faith while I wrestle with thoughts of how the visions fit with my life here and now. I found the scripture to be an encouragement in a season when the world is discouraging. These words made me think about why I’m called but came around full circle to the here and now. The here and now is the season of advent. I’ve been cynical about traditions that have nothing to do with the purpose. Media is filled with controversies and wars based on faith while being sponsored by ads marketing the holiday season. Who’s holiday is this? You see, the King is Coming! That is what the Christmas season IS all about! We can dress it up and take it out anyway we see fit, but the organic truth about this season is the gift of Christ Jesus. We celebrate His birth as a gift. He humbly came into the world without pious celebrations for the sole purpose of a humiliating death. Church billboards do a lousy job communicating the salvation message. How is anyone to know what it means to be washed by the blood of Jesus. That sounds flippin’ freakish to me! Look at the passage above and read the words. Does this sound familiar? All you have to do is watch your social media feed, pick up the paper, or turn on the news to know we are living this out. I’ll travel to the other side of the world, to my neighbors house, to my home town, to the inner city, to my workplace to live out my faith. Whether it’s a stranger in Belize or a friend I’ve known for years– I want them to see something different in my heart to prompt the conversation, “Where do you find the faith to keep going. To stay happy. To [fill in the blank].” THAT is what it’s all about… living it out. Outside the comfort of our 2.5 car garage homes. Outside the red velvet dresses with fluffy collars. Outside the walls of our church buildings. The world is full of broken lives and many of them are sitting in pews on Sunday while the rest are afraid to step inside with a bunch of hypocrites. Are we being transparent enough outside the grand facade to live out our faith with honest transparency? Or will we continue to go through the motions like everyone else, keeping the Good News from hurting people who think you have to have life figured out before you walk into church? Christmas isn’t about traditions. It’s about Jesus and why He was a humble gift for the whole world. Why He continues to be a free, humble gift for the whole world. Jesus’ birth was humble– more like a brown paper package than gold tinsel. Put your whole self in this holiday season. Prepare your hearts during advent instead of your homes. 2015 years ago, many of us might have missed the boat too, trying to prepare a place fit for a king. Please don’t miss the boat this Christmas to receive the most precious gift you’ve been offered. The lowliest of low welcomed Him– dirty, smelly shepherds and farm critters greeted Him appropriately with adoration and their hearts. It was the wise, regal visitors who came two years later that nearly got Him killed. That’s quite an ‘Epiphany’ right there, isn’t it? Go, tell it on a mountain “whether it’s an opportune time or not”. Go, put your whole self in and do the Hokey Pokey! Don’t just go through the motions. Sing the song and dance the dance! Enjoy the Christmas season humbly and with purpose. Carry the season into the New Year to live out 365 days of the year… well, 366 next year. 2016 is a Leap Year. Christianity isn’t about Christmas traditions. I didn’t travel to Rwanda or Belize to tell them about Jesus so they could hang a wreath on their front doors and join a special club called Christianity. Most of them don’t have a front door. We went to give them the opportunity of a lifetime. Literally. I am trying to live more humbly. I am pressing on to be refined to His image. I am aware I am a hypocrite to many but I keep on learning and growing. These words assure us this is a come as you are event. If you show up to church on December 25 expecting to see a show to warm your heart, I suggest you stop back again the next weekend for a visit that might change your heart. Try it, over and over. Go to a place that teaches truth and isn’t caught up with rhetoric and routine. Rhetoric and routine is religion. If that is what you remember from your traditions, try something different. The truth is available in a humble package. Ask me. I’d travel the world just to tell you.